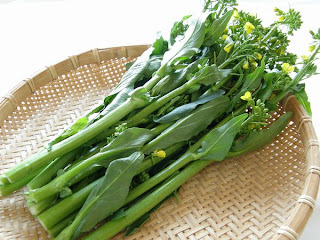 Autumn Poem is one of the representative vegetables of Niigata, where Kumiko is from. Also known as asparana, the taste and texture of this green resembles asparagus. The main stalk, flowers, and young leaves are eaten together. Autumn Poem has light sweetness, a mild taste, and a pleasingly firm texture. Autumn Poem is a good source of dietary fiber, and a superior source of nutrition. It is asy to eat and versatile--it can be parboiled, stir-fried, or in salads. Though the name is autumn (referring to the best planting season), the tiny yellow flowers are one of the the first signs of spring. The deep green and cute flowers are a satisfying addition to any plate. We typically have Autumn Poem at the markets in spring, early summer, and autumn.